The investment rush has been fuelled by a credit surge, with the credit to GDP ratio at 140%, much higher than other Bric (Brazil, Russia, India and China) countries. Says the note: “If loans continue to grow at the current 35% rate, credit to GDP ratio will be close to 200% in China in 2010, even with GDP expanding at 10%. This is a level similar to the pre-crisis Japan in 1991 and USA in 2008." What’s more, credit growth is increasingly delivering less bang for the buck. For instance, in the period from 2000 to 2008, it took on average $1.5 (around Rs70) of credit to generate $1 of GDP growth in China. This compares very favourably with the peak $4 of credit for $1 of GDP in the US in 2008. However, in H1 of 2009 in China this ratio was already at around $7 of credit to $1 of GDP growth. Investment in China has usually been ahead of demand, but then that was during the boom and if the world is going to go through an extended period of low growth, as most economists predict, then all extra investment does is create huge overcapacities. And that could lead to more bad loans for Chinese banks. Here are a few examples of the extent of overcapacity, according to Pivot Capital Management: in steel, idle capacity in China is about the size of capacity for Japan and South Korea combined. In addition, there is 60 million tonnes (mt) of steel capacity currently under construction; in cement, China’s estimated spare capacity (around 340 mt) is more than the consumption in India, the US and Japan combined. In aluminium, out of China’s 15 mt of capacity more than 1.5 mt is idle, which is just about the same level as the total aluminium capacity of Brazil or India. 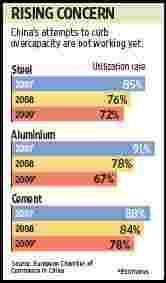 The European Chamber of Commerce study also says there’s overcapacity in flat glass, refining, ethylene and wind power. There’s also plenty of anecdotal evidence of large commercial office blocks lying empty. And so far, the government’s attempts to curb overcapacity are not working. Of course, the majority view is that China will continue to grow strongly and Morgan Stanley economists say that much of the investment is in infrastructure rather than new capacity. But as historian Niall Ferguson has pointed out, China and America can be thought of as one country, aptly calling it Chimerica. So if the US suffers, can China be far behind? What will be the impact on the world? All this overcapacity means that Chinese exports will act as a deflationary force, pushing down prices for manufactured goods worldwide while pushing up raw material prices because of the continuing investment. For the global economy and markets, it remains one of the biggest unresolved problems of the crisis.